“Until the early 1970s, when Chef Paul Prudhomme began teaching the gospel of South Louisiana cuisine, boudin, tasso, andouille, and cracklins weren’t well-known outside the area. These pork-based items were typically prepared during a boucherie, a communal slaughtering and butchering of a fattened hog, in which participants received their share of the meat. Too many years ago to count, I remember boucheries that were held two or three times each winter at my Grandfather Broussard’s farm near St. Martinville. After the pig was slaughtered, family members, friends, and farmhands gathered at long wooden tables and worked feverishly throughout the day making boudin, chaurice, andouille, and fresh pork sausage. The trimmings were cut into strips, much like jerky, dried, then smoked. (This was the forerunner of what we now know as tasso.) Other pieces were packed in brine and stored in crocks to become salted meat to flavor vegetables like greens and beans. There were cauldrons of sizzling grattons (or cracklins) and a big cast-iron pot of thick, spicy backbone stew that served as the evening meal when all the work was completed. In these days of modern refrigeration, boucheries are seldom held. Sausages, boudin, and cracklings are now available at butcher shops in South Louisiana and at many convenience stores and supermarkets, but adventurous cooks still enjoy making their own boudin. After all, it’s little more than a combination of rice, bits of pork, liver, and just the right amount of trinity, right? A classic recipe for Fried Boudin Balls. Spread bread crumbs evenly on a large platter. In a shallow bowl, combine eggs, salt, cayenne, and hot sauce. Form Homemade Boudin into walnut-sized balls. In a large Dutch oven, pour oil to a depth of 2 inches; heat over medium heat until a deep fry or candy thermometer registers 360°. Add balls, in batches, to the egg mixture, then roll in bread crumbs, coating them evenly. Fry balls, in batches, in oil until light brown, 2 to 3 minutes. Drain on paper towels. Serve warm. As an alternative, boudin balls can be flattened into patties and fried in oil in a skillet until crispy. In a large bowl, add rice, and fluff with a fork. In a large Dutch oven, combine pork, liver, 2 quarts water, onion, bell pepper, celery, 1 teaspoon salt, ¼ teaspoon cayenne, and ½ teaspoon black pepper. Bring to a boil over high heat; reduce heat to medium-low, and simmer, uncovered, until pork and liver are tender, about 1½ hours. Remove from heat, and drain, reserving 1½ cups of broth. In a large bowl, combine pork mixture and rice, remaining 3½ teaspoons salt, remaining 1¾ teaspoons cayenne, remaining ¾ teaspoon black pepper, remaining ½ cup parsley, and remaining ½ cup green onion. Mix well. Add reserved broth, about ½ cup at a time, combining until mixture is moist but holds together when squeezed. Form mixture into balls or patties and use, or freeze up to 3 months. I wonder if you could bake these. My family loves boudain balls but we don’t eat fried foods. They sound amazing! 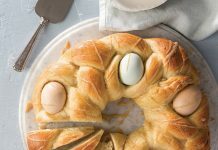 You could certainly bake these; we’d recommend baking at 425 degrees, turning, as needed, until browned, about 20 minutes. I would like to make boudin balls for a shower I’m hosting and wanted to know if I could fry them the day before and reheat them in oven the day of or would the texture/taste suffer at all? Thanks for asking! 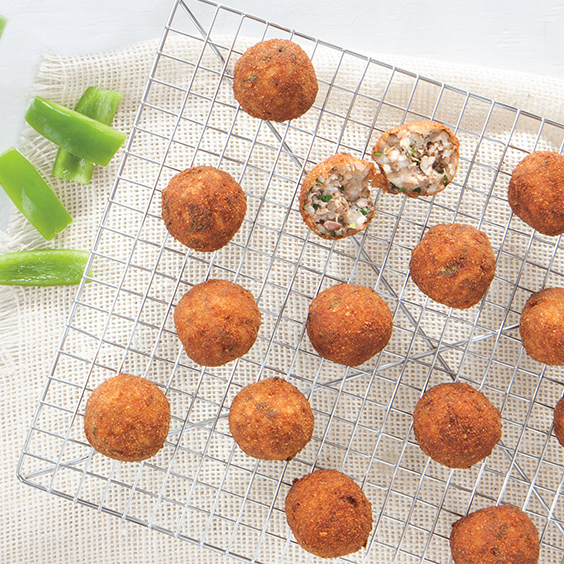 The short answer is that these boudin balls have the best flavor and texture fresh from the frier. That said, if you have access to an oven on the day of the wedding shower, you could fry them the day before and then crisp them up in the oven before serving. cant wait to try these. my dad used to make a hash with organ meats, when they had hog killing day. Do you have a recipe for this. it had a blackish broth . It was so good. Haslet stew is what we called that stew. The best part of the hog killing day. For the rice, is that 3 cups before or after cooking? That is 3 cups before cooking. Thanks for asking! Can I use boudin sausage from the grocery store instead of making it myself just taking it out of the casing? You could certainly do that! This recipe calls for about 4½ pounds of boudin.